Nothing really to report on but I have a few picts of a stretched wash and go from this past weekend. I was out and about Friday night and wanted to wear my hair out. I stretched it with my hand held blow dryer manually that morning, and I wore it at work in a few buns whenever I was sitting at my desk. That night I let it free on the town lol. I did the wash and go the day before on Thursday morning with some Fructise cream I am trying out and the Eco style Argen oil (yellow) gel. It was an average wash and go, with pretty good next day results. I've added some shea butter daily to keep it soft and shiny, and as of today I have still not washed my hair lol. I have it in a big flat twist in front and a side bun. SO I guess it was successful as a styling session for longevity! Gorgeous hair! I wish I could make my wash n go's look like this. 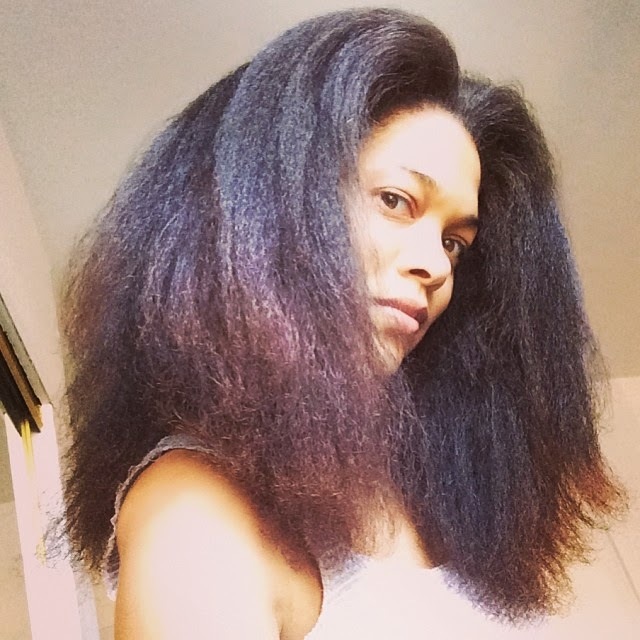 Do you detangle in the shower when you wash n go or does it mess up the clumping effect? Your wash n go came out fierce!!! Your hair kinda reminds me of Tracee Ross's, but with tighter curls. I guess it's the shape. I love your hair. It gives me fever every time lol.